As an online business, deciding which communication channels to use can be challenging. Many businesses try to ‘do it all’ and are shocked and confused when they don’t get the results they’d hoped for. 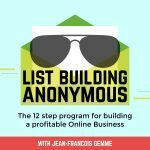 In today’s episode, Jean takes you through the correct way to select the best communication channels to use when growing your online business and why you should have at least two of them. Enjoy today’s short and insightful episode.